Granddaughter Sage lives on the other side of town but goes to school one block away from us at the same elementary school her daddy attended. She won a lottery position in a dual-language school that teaches her Spanish along with English. “I already know English, so it’s really only Spanish I’m learning,” she told me today. We had an after-school “Gus date” so we could finish the loop-loom potholder she started several weeks ago. 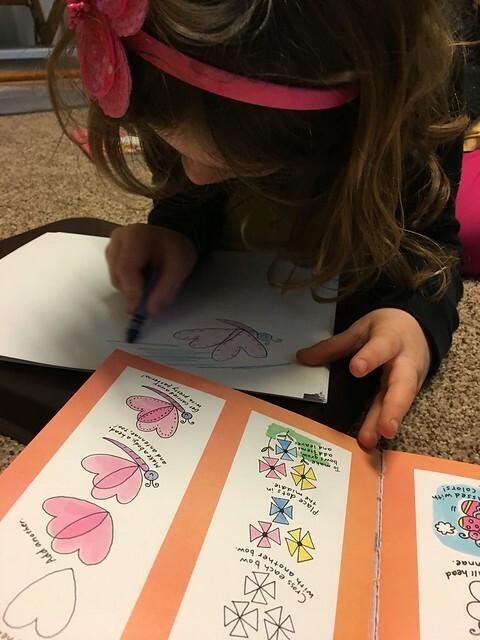 With our remaining time we colored together and talked, then I watched her follow perfectly these step instructions to draw a butterfly. Now that she’s nearly six (two weeks and three days) I can see us enjoying more after-school craft-and-make-things Gus dates. Maybe you have ideas for me.